With a few quick little changes, Honda's brought a bad car back into contention. 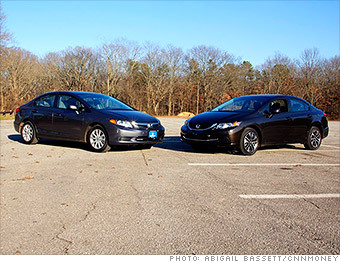 I was really surprised when I first drove the 2012 Honda (HMC) Civic... in the bad way. The interior was cheap and ugly so that working the radio and climate control felt like operating hospital equipment. The suspension, likewise, provided the worst performance in every situation. I felt every bump and dip but, when cornering, it let the Civic's body roll like a frozen turkey in an empty shopping cart. Then there was the noise. Ugly sounds came from the straining engine and from the body as the Civic slammed and bounced over rough roads. How could Honda have gone so badly wrong? I wasn't the only reviewer to hate the car. For instance, Consumer Reports refused to give it its recommendation. And so Honda set out to fix the problems. Honda swears it wasn't because of bad reviews. It says its engineers recognized the problems all on their own and they set out to fix them quickly. Whatever the reason, the results were a new, and much better, Honda Civic. Read on for the details and, if you bought the 2012 Civic, put something soft near the front edge of your desk. That's where you'll be banging your head.